My blog anniversary is just around the corner. Yep. Number six. And I am trying to wrap my little gluten-free brain around it. Six years. Six. That is a long time in blog years. (Maybe blog years are kinda like dog years? Every twelve months of blogging seems equal to seven human years. What I think I'm trying to say is that GFG feels... more grown up somehow. She's no longer a lurching toddler- or as Johnny Depp likes to phrase it, "tiny drunk"). The bumble-puppy years are over. I began blogging and sharing my recipes in late fall of 2005. 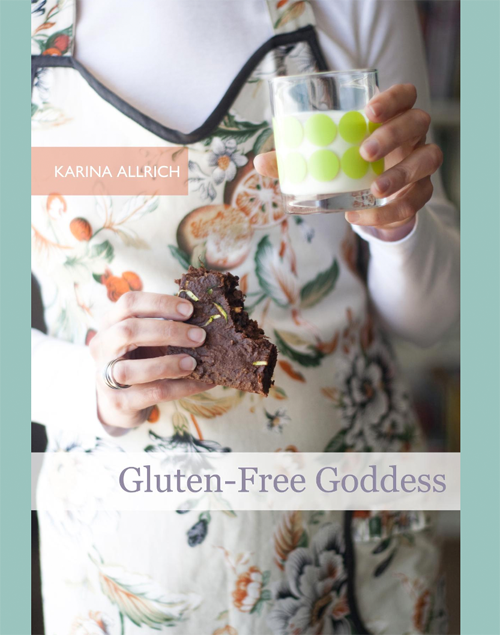 There are over 400 original gluten-free recipes now on Gluten-Free Goddess. This astonishes me! 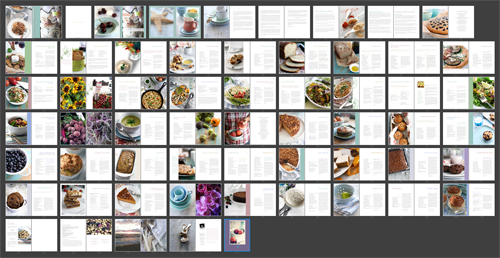 So I began working on creating an ebook cookbook- a complement to the dynamic blog format. And what I found was a program at Blurb that allowed me to create a bright and beautiful presentation of my work- in ebook form. With Apple's clean design, and that cool page-turning experience. To celebrate six years blogging gluten-free I have selected forty-five of my best-loved favorites- the GFG recipes my family turns to, week after week. 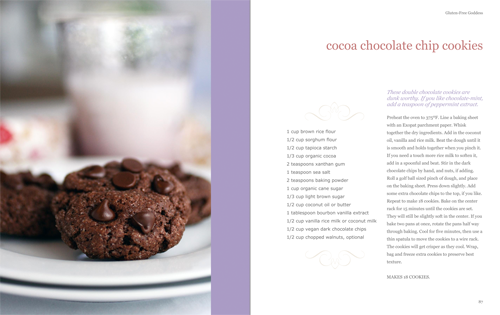 And many- if not all forty-five recipes- happen to be reader favorites as well. Note: This new ebook is in Apple epub format- with all its full color, page turning goodness. Compatible with iPads, iPhones, iPods. It looks beautiful, Karina! It also makes me want to do something similar. I don't yet have an iPad or I'd be downloading it right this second. Soon, I hope! Wow, what a great project. I am so excited for you! gorgeous, what an amazing collection! Congratulations -- beautiful through and through! Congratulations! I also love having my iPad in the kitchen. It's the perfect recipe reader. Congratulations Karina! I love this eco-friendly option of purchasing a cookbook. Can't wait to order my e-copy. I don't have an iPad or an iPhone. Can I still download the cookbook and print out the recipes on my computer? STUNNING! ThoughI don't have an Ipad or an Iphone. :( Would there be any way I could ask someone with an Ipad to print out the ebook for me & I could use it as my own makeshift cookbook??? Oh I do have an Apple laptop! Could I download it on there & print it out? 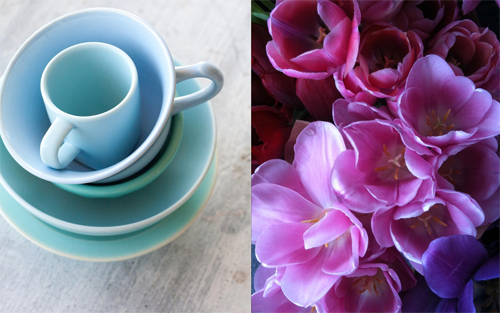 It's gorgeous, Karina! Congratulations! The preview is wonderful. The feel of the book is quietly beautiful, and your photos, as always, are stunning. The cover is perfect. Thank you Karina for a beautiful and artistic cookbook that so many people need and will benefit by. I am looking forward to a version to download to my computer next year. You have been very helpful to me in trying to learn and instruct others in my cooking classes for better health. I will share this announcement on my FB page so that others can purchase your book also. Your recipes far exceed any others I have looked at. Thank you for all the research and time and I am sure a labor of love that you have shared with so many. Looks beautiful!! Can't wait for the kindle format! Looking forward to the Kindle edition. Congratualtions Karina. Congratulations to you, Karina - what a beautiful book! Just ordered it :-) Congrats, Karina. I'm so happy! Just lovely Karina. Your photography is always so breathtaking. Thank you for being such an inspiration. Congratulations Karina - looks fabulous! So glad you decided to put this collection of favorites together. Wonderful!!! Looking forward to the Kindle edition! also looking forward to the kiddle edition as well. what a wonderful project and so beautiful! i'm so excited about the possibility of supporting your work... this blog and your hard work has gotten me through some tough spots. thanks for all you do! when i first saw my blog on an iPad i wanted to kiss myself. What a wonderful gift idea. The pictures are phenomenal, particularly the way you have laid everything out. Congratulations! I love that you stuck with what felt right and did the solo thing. Sometimes we just have to fly. Wow, that's gorgeous Karina! Brilliant idea and execution. Lovely.